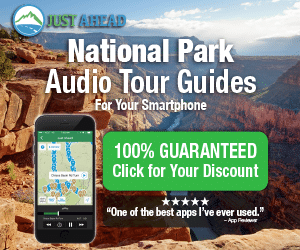 Just Ahead has added Yellowstone National Park to its collection of smartphone audio tours, just in time for the peak travel season to America’s original national park. Yellowstone is the ideal setting for a Just Ahead tour, with more than 300 miles of incredibly scenic roads fashioning a giant figure-eight loop through a landscape of mountains, meadows, and thermal marvels. Old Faithful…Grand Canyon of the Yellowstone…Artist Paint Pots…Norris Geyser Basin…Yellowstone Lake… are all among the 600-plus narrated stories in the most extensive guide we’ve ever produced. As you drive through the park, you hear stories about these and hundreds of other remarkable sights, plus tales of the park’s charismatic mammals and birds. And the best places to see them—bison, elk, grizzly bears, moose, wolves, pronghorn, beavers, trumpeter swans, and giant lake trout.